1. Eat plenty of high antioxidant superfoods. Powerful fruits, including blueberries, blackberries and kiwi, contain potent phytochemicals and key micronutrients that help increase energy, fight aging and boost metabolism. 2. Get plenty of Omega 3 fatty acids. Eating fish or taking a high quality Omega 3 Supplement helps regulate metabolism and boost oxygen intake, thus increasing energy. 3. Consume plenty of Magnesium rich foods. Magnesium is responsible for over 300 enzymatic processes that help keep you energized and healthy. If you're deficient in Magnesium, that's over 300 processes your body can't do! Eat plenty of Spinach, Chard and Pumpkin seeds to get a daily dose of Magnesium. 4. Boost polyphenol intake. The powerful health benefits of fruit come from polyphenols. These micronutrients found in plants boost metabolism, energy, reduce fatigue, support youthful skin, improve digestion, fight aging and support the immune system. 5. Reduce sugar consumption. While the polyphenol content in fruits can help you achieve many health benefits, the sugar/fructose content can make you gain weight. Fruits are full of sugars that can override the weight loss and other health benefits of polyphenols. Eating massive amounts of fruit to get the necessary polyphenols can have many negative health consequences. At RealDose Nutrition, I spent years developing a solution to give people the powerful benefits of polyhpenols without the added sugar and weight gain of fruits. My new premium polyphenol supplement called RealReds, is a unique powder blend of the world's most exotic and clinically studied fruit extracts. If you are one of the millions of Americans who suffer from constant fatigue, low energy, poor focus and digestive issues, then you need to try RealReds for yourself. My idea was to create a supplement that gives you the powerful benefits of polyphenols without the excess sugar and carbohydrates. Being conservative, you would have to consume at least 350 calories per day of fructose/sugar to get even close to the benefits of RealReds. Your body needs polyphenols from fruit, but it doesn't need the sugar. 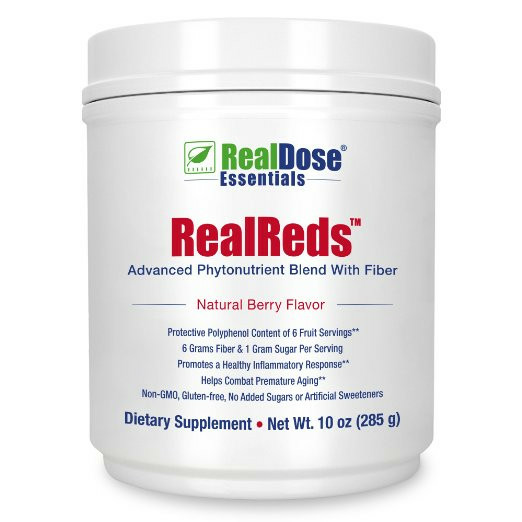 RealReds offers a premium blend of natural superfruits and prebiotic fiber with only 35 calories and 1 gram of sugar per scoop. Just one small delicious scoop supplies your body with an impressive array of organic polyphenols, antioxidants and phytochemicals. RealDose Nutrition's high fiber polyphenol powder includes Organic Agave Fiber, Apples, Blood Oranges, Wild Blueberries, Aronia Chokeberries, Grape Seed Extract, Pomegranates, Strawberries and Tart Cherries. RealDose sources their organic wild superfruits from Sicily, Canada, Alaska and California utilizing only the freshest and most clinically studied fruit powders available. 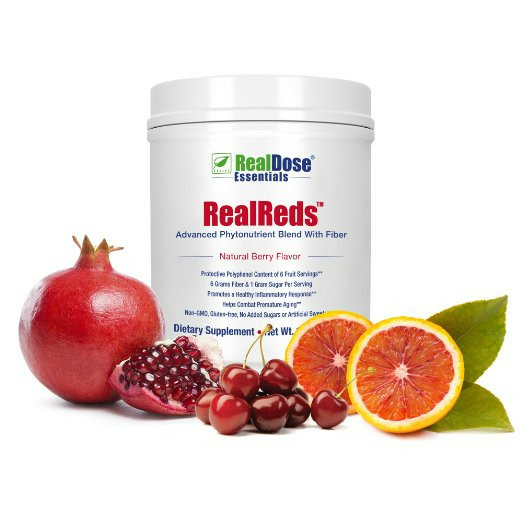 RealReds is on sale while supplies last on RealDose Nutrition's website. I scoured the world to find these clinically proven fruit extracts and powders at the right scientific dose. 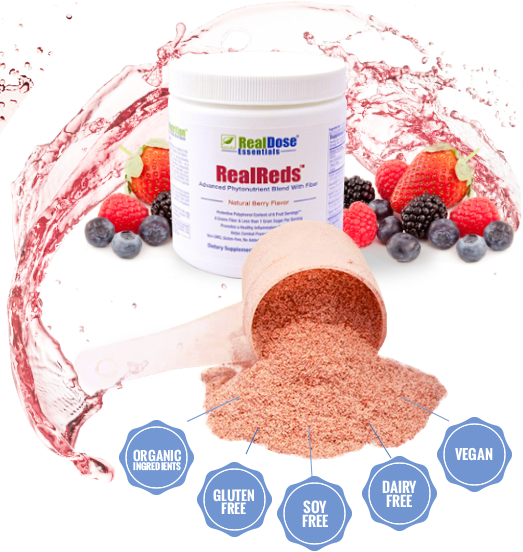 RealReds is a powerful antioxidant superfood powder that tastes great without the sugar. RealReds contains no artificial sweeteners, gluten, additives, soy, preservatives or sugar alcohols. Eating loads of organic fruits everyday is expensive, time consuming and contains massive amounts of sugar. I designed RealReds to cost as little as $1.47 per day, less than a cup of coffee. And remember, you're getting clinically proven fruit extracts you won't find anywhere else on the market except with RealReds. RealDose Nutrition manufactures all of their supplements in the United States in an FDA registered facility that adheres to Good Manufacturing Practices (GMP). Each order comes with an unparalleled 365 Day 100% Satisfaction Guarantee. RealDose offers this guarantee because they are so sure you will love RealReds. RealReds is easy to mix in water or in your favorite smoothie, it tastes delicious and is convenient for anytime of the day. It gives you that extra energy boost along with a precise blend of clinically proven fruit extracts at high polyphenol doses. Join thousands of customers today who are regaining their vitality with RealReds! 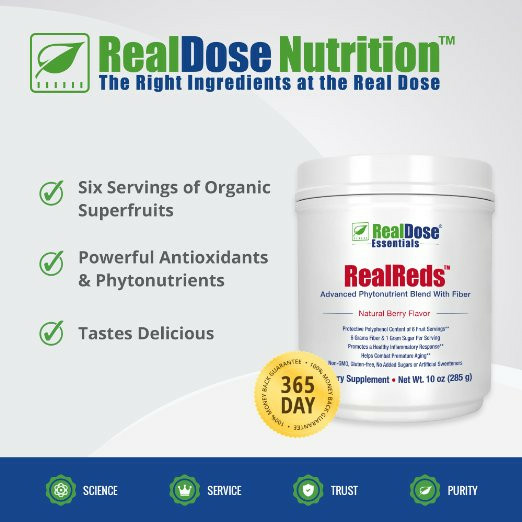 Click here to purchase RealReds today before RealDose runs out of stock of this revolutionary polyphenol rich powder supplement! 1. Holscher HD, et al. J Nutr. 2015;145(9):2025-32. 2. Levers K, et al. J Int Soc Sports Nutr. 2016;13:22. 3. Levers K, et al. J Int Soc Sports Nutr. 2016;13:22. 4. Puglia C, et al. J Cosmet Dermatol. 2014;13(2):151-157. 5. Puglia C, et al. J Cosmet Dermatol. 2014;13(2):151-157. 6. Puglia C, et al. J Cosmet Dermatol. 2014;13(2):151-157. Just one RealReds scoop tastes delicious and includes organic fruits and polyphenols that boost energy.